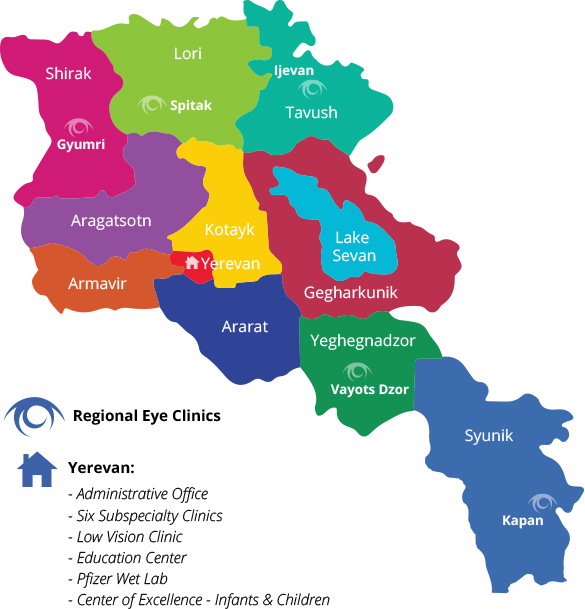 Armenian EyeCare Project » Regional Eye Clinic in Kapan Opens! Regional Eye Clinic in Kapan Opens! One major accomplishment during the Armenian EyeCare Project’s 25th Anniversary Medical Mission and Trip to Armenia was the grand opening of our third Regional Eye Clinic in Armenia — and the first-ever eye clinic in Armenia’s southernmost province — the AECP Kapan Regional Eye Clinic in Kapan, Syunik. On July 21, 2017, AECP physicians, staff and donors joined Syunik Governor Vahe Hakobyan and representatives from Armenia’s Ministry of Health to unveil the AECP Kapan Regional Eye Clinic with a ribbon-cutting ceremony followed by a small reception. Located in the capital city of the southernmost province of Armenia, the AECP Kapan Regional Eye Clinic will allow those living in the southern part of the country to receive the quality eye care they need without having to travel several hours for care. Benefactors tour the new clinic in Kapan. The clinic boasts an eye examination room and state-of-the-art operating room, named the Araxie Apigian Kayaian Operating Room, and is equipped with cutting-edge medical devices provided by the AECP to increase accessibility to high-quality eye care for residents of the province. Both the exam room and operating room of the Regional Eye Clinic are equipped with modern ophthalmological devices, granting doctors the opportunity to provide complex eye care in a city very far from the country’s capital. 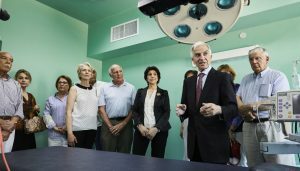 AECP Founder and President Dr. Roger Ohanesian explains how the Regional Eye Clinics make it possible for people in Armenia — no matter their geographic location and financial status — to receive the highest quality care. The Donor Wall located at the Kapan Regional Eye Clinic. 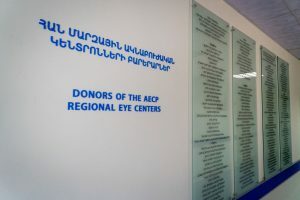 At the newly established Regional Eye Clinic in Kapan, surgeries will be carried out under the supervision of trained specialists from the AECP and the Malayan Ophthalmological Center, a leading eye hospital located in Yerevan. Through telecommunication systems in the examination and operating rooms, local medical staff can contact physicians at the Malayan Ophthalmological Center for ongoing discussion and consultation in the diagnosis of complicated cases as well as during surgery. Dozens of benefactors, whose names appear on a Donor Wall at the clinic, made developing the Regional Eye Clinic in Kapan possible. The establishment of five Regional Eye Clinics throughout Armenia is the crux of a comprehensive effort by the Armenian EyeCare Project and Armenia’s Ministry of Health to revitalize the eye care delivery system throughout Armenia. Since the program began in 2015, the AECP has developed three of our five Regional Eye Clinics. The Haig Boyadjian AECP Regional Eye Clinic opened in Ijevan, Tavush in 2015; the John and Hasmik Mgrdichian AECP Regional Eye Clinic opened in Spitak, Lori in 2016 and the AECP Kapan Regional Eye Clinic marks the third clinic to open in 2017. Two other Regional Eye Clinics — one in Gyumri, Shirak and another in Yeghegnadzor, Vayots Dzor – are scheduled to open in 2018 and 2020, respectively.